The Umbra Ribbonwood Clock is a wall clock, which connects the natural material with modern design. The clock lives from its contrasts, which transform it into a real eye-catcher. The Umbra Ribbon Clock existed made of metal before. The designer Michelle Ivankovic was convinced by the feasibility of the elegant shape with natural materials and therefore he used wood for the re-interpretation of her wall clock. Her Ribbonwood Clock is based on the ancient art of bending wood and it has an effect with its special shape, being a decent artwork in the room, which still reminds beautifully in the background with its decent materials. 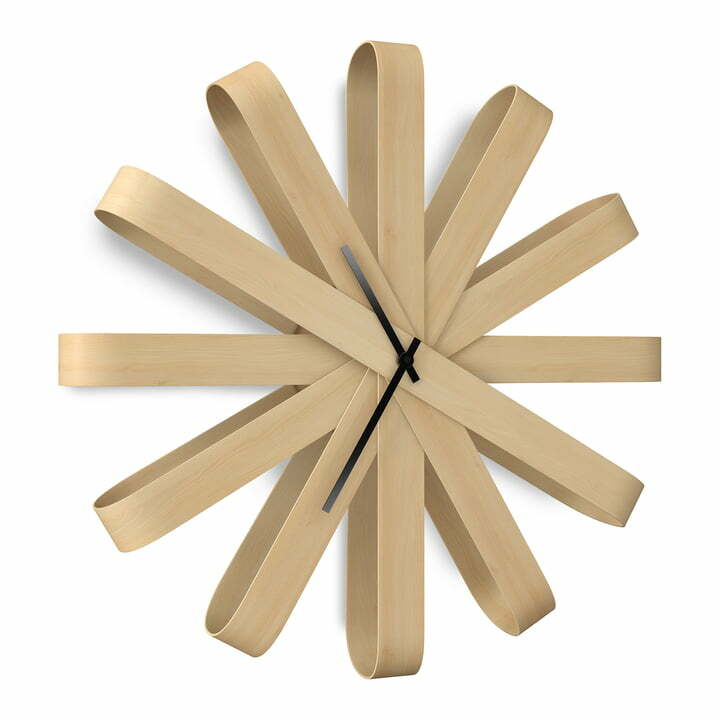 Umbra produces the Ribbonwood Clock out of beech wood. Beech is stable and as well elastic, and therefore predestined to be used as bendable wood. The equal and decent grain emphasizes the wooden bands of the Umbra Ribbonwood Clock, which feels comfortable in cool and modern designed interiors with these qualities.